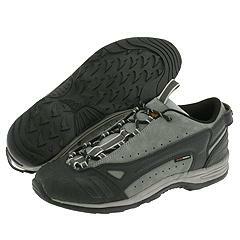 Approach shoes tend to be either very close to a climbing shoe - climbing performance over comfort - or very close to a hiking shoe - comfort over climbing performance. The Garmont Sticky Cloud is definitely the latter, and for those looking for a bombproof shoe for via ferrata or long grueling approaches, it excels. The Sticky Cloud is a burly shoe, no doubt about it. Tipping the scales at close to two pounds for a pair, the shoe is clearly built to take serious abuse: a rock-solid toe cap and thick, high-void tread will protect your precious little piggies through the gnarliest of boulder fields. The sole wraps around the heel, complete with tread blocks, so if you need to land a heel hook you're good to go. 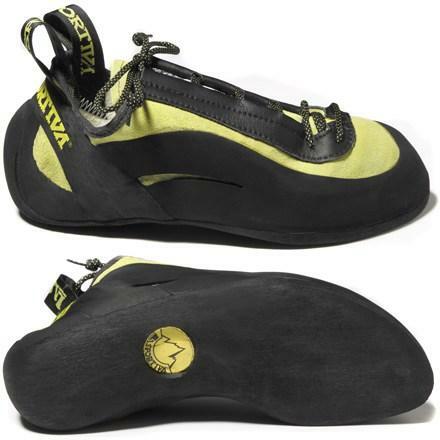 Really the only nod made to pure climbing features are the laces, which go down to the base of the toes for a solid fit, and the flat surface on the sole at the point of the toe, which makes it easier to smear and edge on smaller ledges and pockets. Where the Sticky Cloud really shines is on the descent, with generous padding under the heel that cushions the roughest heel strike. One nice small touch is the heel lock setup: the cord that wraps around the heel has little plastic grommets for the laces, which keep them from getting too twisted. If you're looking for a shoe that will coddle your feet during long approaches and steep descents and still give you some options for making the occasional class five move, check out the Sticky Cloud. The holy grail of shoe design is, of course, a flip flop that comfortably climbs 5.10. I wouldn't be surprised if the mad docs at Mad Rock are working on just that, but in the meantime they've given us the Fanatic approach shoe. If you're looking for a hiking shoe that climbs look at Mad Rock's Frenzy. If you're looking for a climbing shoe that hikes, the Fanatic is your tool. The laces cinch up snug to the toes, and the burly tongue is leather reinforced to let you really crank 'em down tight. The toe box is rubberized and is more comfortable than any straight rock shoe for camming in cracks, and even the heel is serrated rubber for light hooking duty. It's stiff enough for serious slabbing and easier edging, and the arches are cut just enough to straddle an etrier if big wall aid is your fetish. A mild lug system built out of sticky #5 Mad Rubber makes short work of scrambles. Overall the Fanatic will get you there and back again, and crush most grades up to 5.10+ without having to resort to your dance shoes. These award-winning shoes are good performers at a great price. 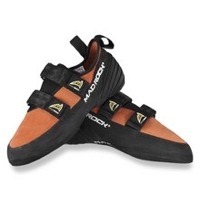 Mad Rock's line of climbing shoes is competitive with those of other major manufacturers, and they appear to not be adverse to buying market share; their shoes are smokin' good deals that often undercut the competition. 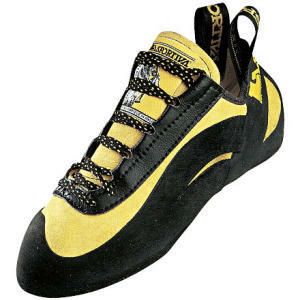 I wore these shoes for last year's climbing season and found them to be comfortable if a bit stiff. Since I do a lot of friction smearing I find myself frequently going retro with my early 1990s vintage Five Ten UFOs (Anyone? Anyone? Bueller..? ), which are oh-so-buttery soft and smell so skanky I climb extra fast to get away from them. The extra stiffness of the Flash will be welcomed by beginners or anyone who likes a little extra support for edging and pockets.